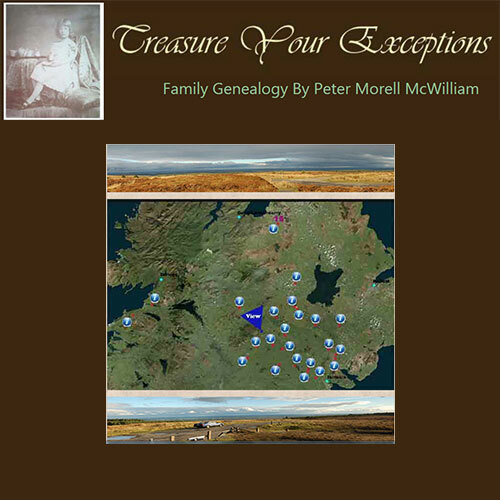 This blog can be considered as a companion to my family genealogy web site ‘Treasure Your Exceptions’. The panorama in the header is of the River Boyne at Slane on the Dublin to Monaghan road and represents a scene familiar to me from my childhood and teenage years. I was born in Monaghan. However I went to boarding school in Dublin at nine; on the way up to Dublin we frequently stopped just at this point for sandwiches and a flask of tea. I suspect that part of my interest in genealogy (initiated when my father died in 1989) is an attempt to recover my ‘lost’ childhood. In that respect the panorama is symbolic – a border between North & South and also between my childhood and adult years. This blog will explore aspects of family genealogy – (childhood influences) -coloured by my career as a geneticist (adult influences). Of course these interests overlap as indeed my childhood influences carry over into my adult years. In practice, the structure of these blogs will be random and the above are mere pointers to themes that may be covered. I shall endeavour to post in the form of questions to be answered. I invite you to supply any corrections, ideas or indeed facts bearing on the various posts.